Qi Wireless Charging has not been my favourite option due to inconsistencies in products and implementation by manufacturers. When I had my Samsung Galaxy S5, I bought the official Samsung Qi Wireless Kit which included the Samsung Qi back cover and charging pad. Let’s just say that this was a disastrous piece of kit and poorly implemented by Samsung. Apart from the back cover being thicker than the standard back cover, meaning existing cases won’t fit, the Samsung charging pad was temperamental and once it charged the S5, it turned off so by morning the S5 could be down to 80% battery. It had other issues too. So, when I ordered the official Wireless Charging Kit for my Note 4, I was expecting to return it but to my surprise it actually is bullet proof in operation. In the box you get the charging pad and replacement back cover. Firstly you remove the back cover and swap it for the Qi version. This adds additional thickness so once again your cases are likely not going to fit. Then plug your Samsung charger into the pad (actual mains charger is not supplied) and a LED light turns orange then green, and then goes off. 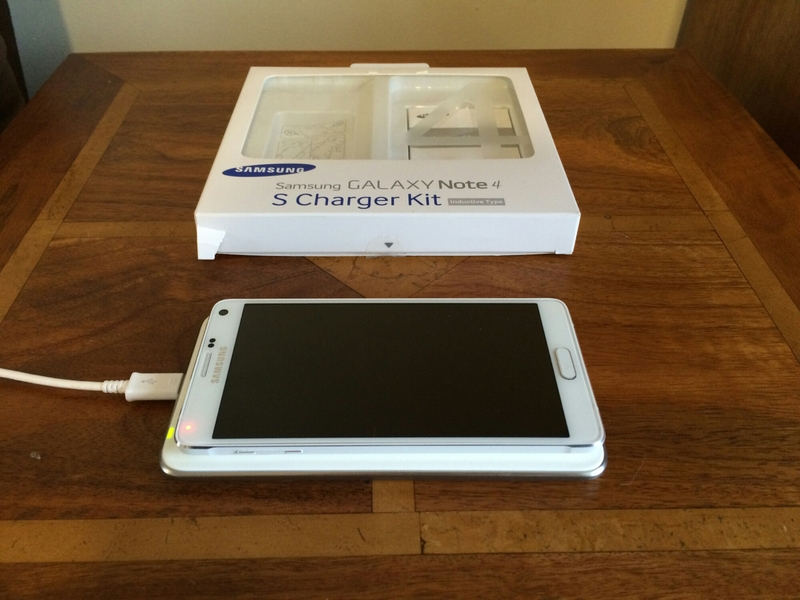 Place the Note 4 on the pad, and the light turns green to notify you it is charging. The LED light does not turn off but to prevent it being too bright at night, I moved the Note 4 a little over the LED. The charging pad still had no issues charging the Note 4. In the morning, the Note 4 battery was at 100%. Also, I have never noticed huge heat issues with this combo. I have also used another Samsung charger (non adapter fast charger) and this also worked just fine with the charging pad. For once the official wireless charging kit did exactly what it said on the tin!